1. You must create a CSV file to import the contacts. Note: It must be in CSV format. First Name | Last Name | Email | Cell Phone | Address 1 | Address 2 | City | State | Zip | Birthday | Buyer or Seller? | Home Features of Interest | Price Range | Comments | Etc. Technically, it doesn’t matter what order the columns are in. The only thing that matters is that each column is labeled in some way. You might label “First Name” as “First” or “First Name”. That also doesn’t matter. As long as YOU know what their labels mean it’s fine. NOTE: There is a 75 character limit for each field! 4. 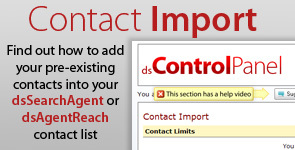 Now, go to the main “Contacts” page and click the “Start Importing Now” button. 5. Browse for your CSV file. 6. Now you will be taken to a page where you will see two columns of information. On the left you will see all the fields that exist on your contacts in the control panel. On the right you will see a drop down menu for each field (this is the reason you must properly label each of the columns on the CSV file because now you simply need to match up each field correctly). 7. Once each field has been matched up properly choose the “Contact Group” on the right that you would like to upload these new contacts to. Hey Ricardo awesome stuff as usual! Side note, just learned that custom search links setup in the DS Control Panel show up as available pre-saved links for dsIDXPress. Thank you for making life easier.